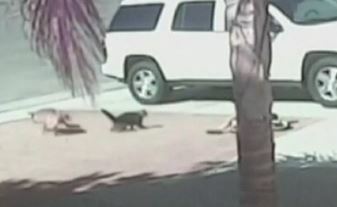 The unlikely rescuer is the family’s cat. It really is astonishing as the rogue dog is dragging the little boy by the leg and the cat streaks towards the dog like a missile: knocking the dog off the boy and then chasing it away. If you haven’t watched it, do follow the link above and watch it. It is incredible. Why are we so amazed? Is it because of the size difference between the cat and the dog? Is it because of the stereotype of cats – that they are self-centred and use humans to serve them – and we have never seen such protectiveness before? Is it because we have never seen a cat act like that anyway? I don’t know all of the family circumstances but the way the cat acted so protectively makes me think that it experiences love and affection from its family – so much that it feels that it is part of the family and its protective instinct kicked in when it saw one of its family under attack. It made me reflect on how we are as a church. We have our Christian faith in common, but we can do more to get to know one another better. Are we so committed to one another, feeling part of this local church family, that our ‘protective’ instinct kicks in when someone else is in trouble and we immediately want to help by praying and offering our support? If you are part of our local church family and would like to be a part of a group that will seek to help us with that, please do let me know. If you aren’t, where is your sense of belonging and loyalty? What binds you to those other people? Apparently the strongest force in the Universe is the Strong Nuclear Force that binds together the nucleus of atoms. *Sorry if your knowledge of cartoons doesn’t extend to the Thundercats of the 1980s.